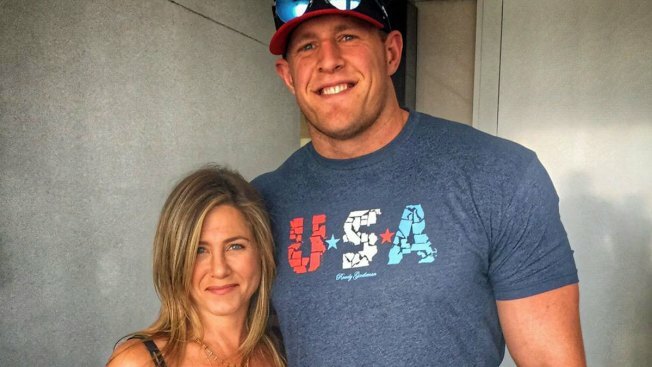 Football player JJ Watt was very excited to meet actress Jennifer Aniston. It's no secret that Jennifer Aniston has long been J.J. Watt's celebrity crush. The Houston Texans star had just never connected with her. Watt finally met the "Friends" star on Monday in Los Angeles, where they are represented by the same talent agency. He was there speaking to the agency's employees and was asked if there was anything they could do for him. Watt didn't hesitate, bringing up his self-described "lifelong goal" of meeting the 46-year-old actress, whom he's mentioned frequently on his social media. At first, the 26-year-old defensive end thought it was going to happen over dinner this week. Instead, she happened to be in the building that day and they were brought together. Watt's name is Justin James. Aniston's is Jennifer Joanna. Watt posted a photo with his arm around Aniston on his Twitter account with the caption, "I'm not even going to try to pretend like I acted cool when this happened." He was still enjoying the encounter a day later. Aniston is engaged to actor-writer Justin Theroux. Aniston isn't known to be a sports fan, but Watt said she knew he lives in Texas.